In just the past few years, David Garcia has emerged as a top songwriter and producer who’s had success in several music genres. 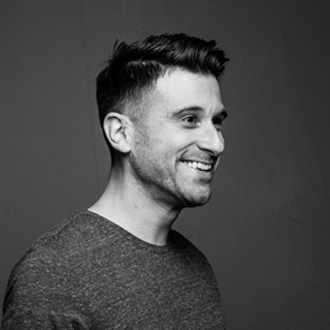 Based in Nashville, he is best known for co-writing the massive pop & country hit “Meant to Be” (Bebe Rexha & Florida Georgia Line), which was number one on the Billboard Hot Country Songs for a record 50 consecutive weeks. “Meant to Be” also reached #2 on the Billboard Hot 100 pop chart. In addition, Garcia co-wrote the current country hit “Take Back Home Girl” by Chris Lane (featuring Tori Kelly). And last year (2017), he co-wrote the #1 hit “More Girls Like You” for Kip Moore. All three of these hits were co-written by Garcia’s friend and frequent collaborator, Josh Miller. On top of this, Garcia has produced country star Carrie Underwood’s upcoming album, which includes her new single, “Cry Pretty.” Garcia produced the entire album with Underwood and co-wrote several songs with her. Impressively, Garcia is already a four-time Grammy Award winner for his work in the Contemporary Christian Music genre, and he’s won nine Dove Awards. One of his Grammy Awards is for Best Contemporary Christian Song, for co-writing the #1 CCM hit “Overcomer” by Mandisa. Notably, in 2015 Garcia was named ASCAP’s Christian Music Songwriter of the Year. We are pleased to do this new Q&A interview with David Garcia. He tells how he co-wrote the big hit “Meant to Be” and his other hits, and he discusses his recent work with Carrie Underwood. DK: How did you get started as a musician and songwriter? I read that you were born in New York. David Garcia: I moved to Florida when I was around 8, to the Tampa Bay area. That’s where I kind of grew up. And honestly, I grew up in church…I played and sang in church. For whatever reason, I really got into wanting to make music. At the time, I was obsessed with looking at the back of CDs, and seeing [the music credits]. Then when I was 18, I drove across country to live in Los Angeles. [I wasn’t successful yet], but I was doing music full-time. After four years in L.A., I had an opportunity where I could work out of a studio at no cost, so I moved back to the Tampa area, and I did that for a while. One thing led to another, and I started making a couple trips to Nashville. Some people told me, “You should really live here, you could do really well.” So I just made the jump. I’ve now been in Nashville for about eight years, and it’s been really good. The songwriters of the #1 hit, “Meant to Be:” (pict. 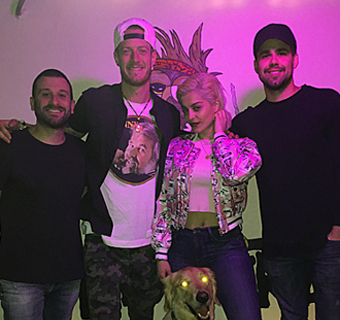 l-r): David Garcia, Tyler Hubbard, Bebe Rexha & Josh Miller. DK: I read that you play keyboards. Do you also play guitar and other instruments? Garcia: Yeah, I’m one of those guys who’s a jack of all trades; I play a little bit of everything…drums, guitar, bass and keys. Keys is probably my main instrument, but over the years, I’ve also played a lot of guitar. Of course, in Nashville it’s very guitar-based. Even on my pop records, I try to fill in a guitar there, just to be different. Nowadays, you have to do a little bit of everything, because so much now is done when you write a song. You’re going from A to B very quickly, and you’re trying to make a record from the minute you’re writing the first line of the verse. Over the years, it’s come in handy to be kind of a one-man band, because it just makes it so much quicker. If you have an idea in your head, you can just get it out, instead of having to rely on calling [musicians], although Nashville has some of the best musicians in world. But as far as the starting-off process, it’s great to be able to [play all the instruments]. DK: Earlier on, you had success working with Christian music. How did you get started in this genre? Garcia: A few years ago, I’ve was fortunate to have some pretty good success in that market. I worked with some of the best artists in that genre. I’m still doing some stuff in the Christian world. More recently, I’ve worked with MercyMe and Francesca Battistelli. But I’m definitely excited about all the pop and country stuff that’s been happening. DK: How did you get into country and pop? Garcia: I was ready to branch out and try some new stuff. I said to myself…let me get in the room with people who I think are really talented. Through that process, I met (songwriter) Josh Miller—a manager friend asked, “Can you listen to the Soundcloud of my friend who’s a songwriter? He’s really good.” He sent it to me, and it was Josh’s early Soundcloud. Then I said, “Man, I’ll definitely write with him…he sounds really talented.” That’s how I met Josh, and that’s how I met a lot of people and one thing led to another. Quite honestly, It’s been pretty amazing. I met my manager, Nate Lowery, through that exchange. He was Josh’s publisher, and we’ve gone on to really do some great things together. DK: Your first country hit was “More Girls Like You” by Kip Moore. How did this song come together? Garcia: Kip is a great artist. What you hear on that recording (of “Most Girls Like You”) is what we did that day. Kip and I produced it together and I ended up mixing and engineering it. Kip is a phenomenal talent in the studio. He can play, he can sing, and he’s got a great instinct when it comes to songwriting. After what we did that day, I said, if I can make it with Kip I could do it with anybody as far as country goes, because he’s really on top of his game. We went on to write several songs for the record, and I’m really proud of those songs. DK: Your next hit turned out to be “Meant to Be,” with Bebe Rexha and Florida Georgia Line. Georgia Line), which was co-written by David Garcia. Garcia: We wrote the song in L.A. We were at a studio called Nightbird Studio, and we were there writing and hanging out for a week. It was me, Josh Miller and Tyler Hubbard (of Florida Georgia Line). I think it was on a Thursday night that we met Bebe Rexha. We literally started with that piano part that you hear, and we had a demo at the end of the night that is very similar to what you hear on the radio. The A&R exec at the time, Jeff Fenster (formerly of Warner Bros. Records), had a discussion with us about how to make it a little more Bebe, and we went in and added a few more elements, and it came together really quickly. Garcia: Yes, that was written by me, Josh and the incredible (hit songwriter) Hillary Lindsey, who’s a favorite collaborator of mine. We do a lot of stuff together. DK: You’ve recently finished producing Carrie Underwood’s new album. Can you talk about this project? Garcia: Carrie and I produced the record together, and it comes out in September. The first single (“Cry Pretty”) is out and it’s been doing very well. I couldn’t be more excited about it, because I think it’s a different shade from the colors that she’s already done. I think it’s going to be really exciting, and I can’t wait for people to hear it. She’s probably one of the most iconic voices of our time…she’s in a league of her own. You’ll hear her being kind of raw and emotional on some of these songs. We also wrote a lot of songs together. DK: How did Carrie decide that she wanted you to produce her whole album? Garcia: How this came about, was Carrie and I got hooked up through our management and we did a songwriting session together. It went really well, and the first song we wrote made the record. And from there, we started writing more. Then after a while, she came to the conclusion, like “Man, there’s something here. This stuff is really good and it’s different. It’s nothing like what I’m getting pitched.” She came to me with the idea and said, “Hey, would you be interested in doing this record together?” And I said, “Absolutely. Sign me up” (laughs). It was really cool because it was an organic thing…I feel like we built a lot of trust together through this process. By the time it came to the studio, we were already on the same page, without even having to communicate a lot of stuff. This is something that I think is important when you’re working with an artist. You want to be able to understand where they’re coming from and what they’re trying to accomplish with their music. DK: I read that you’ve also collaborated with hip-hop artist, NF. What was it like working with NF? Garcia: Well, I’ve been working with NF since his first record (Mansion, in 2015), and he’s on his third now. He just had his first Top 40 pop song (“Let You Down”) which is amazing. When I first met him, I had wanted to do some different stuff. I’ll never forget it—he got on the mic and I just had goosebumps. When we did (the title cut) “Mansion,” it was one of his first, early songs. He is just an incredibly talented person. He signed with a Christian label, but I think that even from day one, the music was so much bigger than a subgenre. I’m really proud that the whole world is getting to hear his talent and appreciate it. DK: Currently, your hit “Meant to Be” has become one of the biggest country singles of all time, with 34 weeks so far at #1 on the Billboard chart. How does it feel to be a part of such a special song? Garcia: Of course, it’s been absolutely incredible. What’s crazy is, when you’ve done music for so long, it’s hard to appreciate the full capacity of it, because it’s your day job. We’re always onto the next record, to the next project. But I will say this. What’s been the most amazing thing about the song, is to know that the listeners really championed the song. It was never meant to be…no pun intended (laughs). At the onset, it wasn’t meant to be a single. I think what happened was, we all saw the consumption of it and how many people were listening to it, and it really grew into a wildfire. The amazing thing that we have now with music, is that the streaming thing has turned the business a little bit around and upside down…everybody’s starting to find their footing. Everybody now has access to [all music]; they can choose. It’s the most level playing field we have. And for composers, songwriters and music people, I think that this is awesome, because for all intents and purposes, that really blurred a lot of lines. Is this a country song? Is this a pop song? It wasn’t about (the traditional way of ) taking it to country radio and promoting it. It really didn’t matter, because people just heard the song and loved it.